Finally, dinner’s over! We’ve eaten our vegetables, we’ve loaded the dishwasher, and it’s all paid off in spades, because tonight, it’s bagels for dessert! Whoa. Bagels, for dessert—what a treat! Seconds? Really, you have to ask? How could we ever pass on dinner’s bonus track, especially when it’s bagels? Load us up, Kemosabe! Now this is dessert done right! Cream cheese? Unnecessary. Nothing beats ‘em plain. Stack those dessert bagels high and dry, chief! 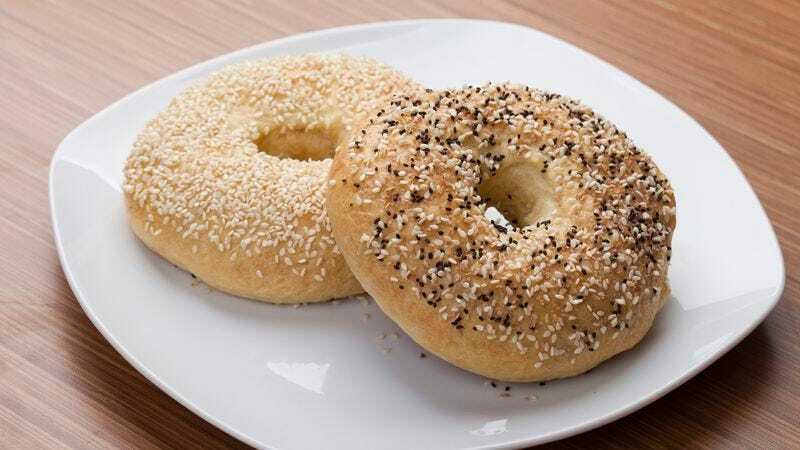 Bagels are just for mornings, right? Well, don’t tell that to these two, because it’s 9:45 p.m. and they are here for one reason only: to be eaten for dessert. Hell. Yes. Look, Antonio’s got one too! Nice! Any other night, we would be eating something like this, but tonight, it’s bagels for dessert. So scram! WHAT?! Sesame?! Incredible. Did we make the honor roll or something? Tonight, we’ve been spoiled. Spoiled rotten.